Kuwait and Nigeria will contribute significantly to capacity growth in the Middle East and Africa’s LNG industry between 2018 and 2022, according to data and analytics company, GlobalData. Nigeria is set to have the highest liquefaction capacity additions while Kuwait and Turkey will have highest regasification capacity additions among all countries in the Middle East and Africa. 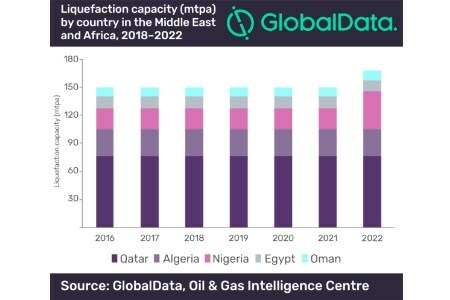 GlobalData’s report, ‘LNG Industry Outlook in Middle East and Africa to 2022’, forecasts total liquefaction capacity in the Middle East and Africa to increase from 172.7 million tpy in 2017 to 234.0 million tpy in 2022 at an average annual growth rate (AAGR) of 6.1%. Similarly, the total regasification capacity is expected to grow from 3.0076 trillion ft3 in 2017 to 5.89502 trillion ft3 in 2022 at an AAGR of 13.5%. Nigeria and Qatar are the major countries in the Middle East and Africa for LNG liquefaction terminals. Nigeria (Nigeria), Ras Laffan III (Qatar) and Ras Laffan II (Qatar) are the largest liquefaction terminals in the region. In the Middle East and Africa, 11 liquefaction terminals are expected to become operational between 2018 and 2022. The total planned liquefaction capacity in 2022 is expected to be 53.3 million tpy. Nigeria will have the highest liquefaction capacity additions of 18 million tpy, increasing from 22 million tpy in 2017 to 40 million tpy by 2022 at an AAGR of 12%. The country is expected to spend US$25.26 billion - more than 30% of the region’s total capital expenditure (CAPEX) - on new build liquefaction terminals during the outlook period. In terms of regasification capacity additions in the Middle East and Africa, 10 regasification terminals are expected to become operational between 2018 and 2022. The total planned regasification capacity in the Middle East and Africa in 2022 is expected to be 2.8875 trillion ft3. Kuwait will lead the Middle East and Africa with total additions of 1.071 trillion ft3. The country’s regasification capacity will increase from 264.8 billion ft3 in 2017 to 1.3358 trillion ft3 in 2022 at an AAGR of 32.4%. The country is expected to spend approximately US$2.9 billion on development of upcoming regasification terminals during the outlook period. Turkey will be the next highest country in Middle East and Africa with planned regasification capacity additions of 392.7 billion ft3 by 2022. The country is expected to spend roughly US$548.5 million on the development of new regasification terminals. In terms of largest liquefaction terminal by capacity in the outlook period, Mozambique (Mozambique) is the top planned LNG liquefaction terminal in the Middle East and Africa with a CAPEX of US$15 billion. The terminal is expected to start operations by 2022 with an expected capacity of 12 million tpy. Al-Zour (Kuwait) is the largest planned regasification terminal in the region, with a capacity of 1.071 trillion ft3. The terminal is expected to come online by 2021 with an estimated CAPEX of US$3.3 billion.